All transactions are safe and secure with a reliable history in online purchasing behind each of our associates. Buy the Refuse to Sink Little Mermaid t-shirt to own Little Mermaid clothing and merchandise. Aside from Ariel, who else would dream of living a life on land when they have a fish tail rather than legs and feet? She dreams big and I bet you do too. Refuse to sink in this Disney Little Mermaid t-shirt that is perfect not only for our favorite redheaded dreamer, but for anyone who has dreams of their own. Whether you want to be a famous actress, travel the world, or simply want a pony, keep your hopes up in this Disney Ariel tee. As she has shown us, anything can happen. 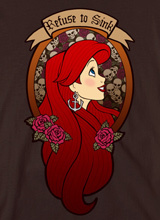 In addition to the Refuse to Sink Little Mermaid tee above, browse the Little Mermaid Clothing Gallery for more apparel like men's and women's clothes, kids shirts or hoodies.